A deadly bear brutally attacked a man who teased it by dangling food in its jaw. 36-year-old, Naiphum Promratee, had decided to visit the temple in rural Phetchabun province, Thailand, with his 4 friends. There were a number of wild pigs enclosed in a small enclosure which was kept there to feed the bear (by any tourist if he/she wants to). But Naiphum began teasing the bear with the food when he reached into the enclosure. In response to it, the bear stood on its legs and attacked him. Bear started dragging him into the enclosure and tearing off his flesh with its teeth. 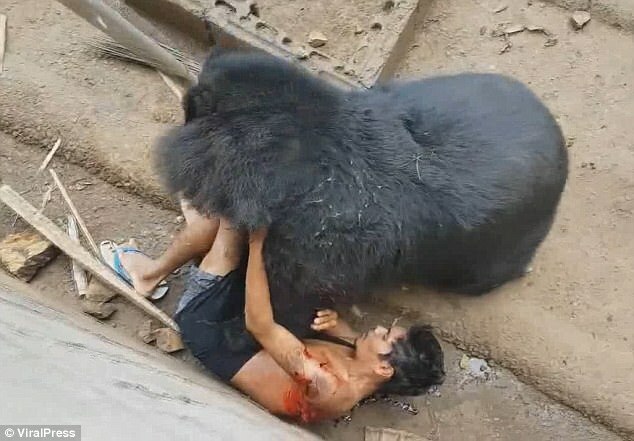 After many efforts, the man’s friends eventually distracted the beast and jumped into the enclosure to dragged him out.